The cutaway Ovation Elite TX Mid Depth Acoustic-Electric Guitar boasts a contour body with quality structural and decorative elements that put Ovation Elite guitars in a class of their own. The Ovation Elite TX offers guitarists maximum performance potential, and unique styling at an affordable price. Lightweight and resilient, the Ovation Elite TX guitar's scalloped "X" bracing and AA-grade solid spruce top lend tremendous power to the soundboard. A maple neck satisfies the need for speed, while the OCP-1K pickup provides exceptional balance note-to-note, even in alternative tunings. The Ovation Elite guitar's cutaway design, 25-1/4" scale length, and 1-11/16" nut width provide comfort for intricate movements up and down the rosewood fretboard. The walnut bridge adds clarity to the tone, and the maple neck provides strength to this solid and surprisingly lightweight instrument. At the heart of the Elite TX guitar is an impressive and intuitive electronics system, that lets you dial in your ideal sound, tune, and amplify quickly and effortlessly. Designed in collaboration with Al DiMeola and Melissa Etheridge, the OP-PRO preamp combines state-of-the-art audio quality with guitarist-friendly features for a preamp that should please even the most discriminating player. It features gain adjuster, tuner, and 3-band EQ. 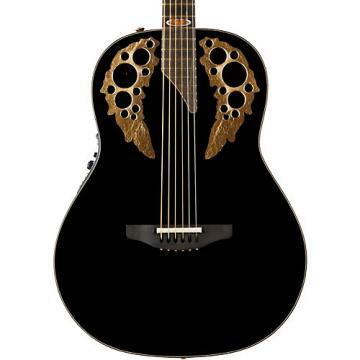 This professional-grade system has been engineered to compliment the unique character of Ovation guitars. 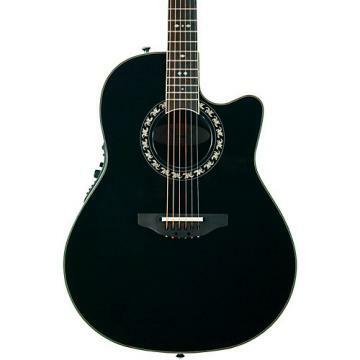 Other noteworthy features include black Ovation tuners, rosewood bridge and fretboard with black stain, black finish, and the signature multi-sound hole rosette on the bass side of the mid depth Ovation Elite TX guitar. This guitar played well and had a good sound however, the tuner didn't have a mute. I got this for live GIGS and the ability to mute the tuner is a must. Bad thing is that I had to pay sixty-five bills to return this item, then was charged shipping from Custom Guitars friend for sending it to me. Won't make that mistake again.